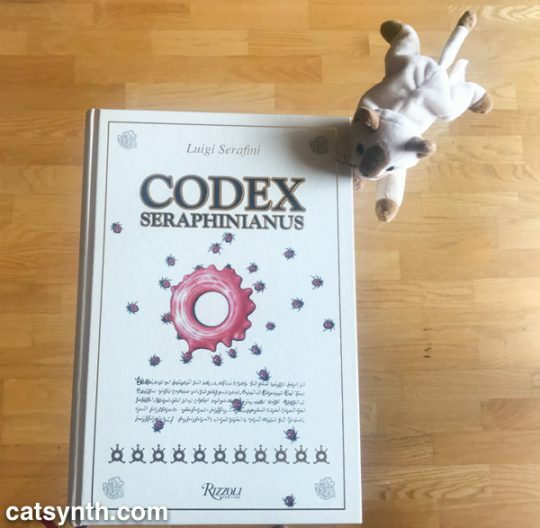 We at CatSynth have been fascinated with the Codex Seraphinianus long before this beautiful edition made its way to CatSynth HQ. 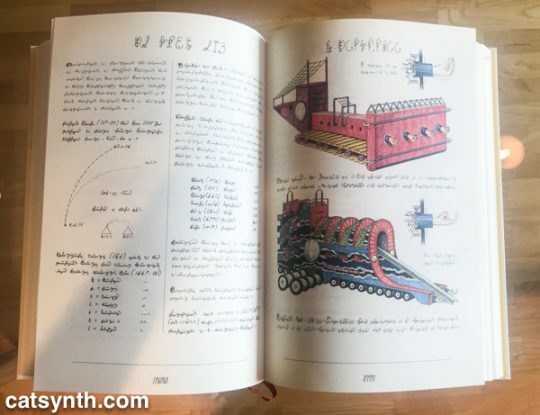 The Codex is a masterpiece of book art by Italian artist, architect and industrial designer Luigi Serafini. 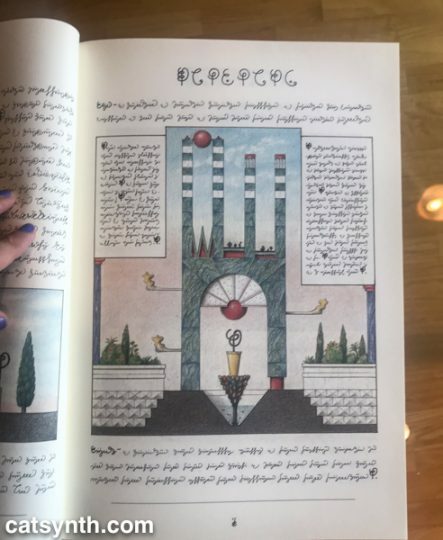 It is an illustrated encyclopedia as a handwritten manuscript with hand-drawn color illustrations depicting a surreal imaginary universe of objects, creatures and concepts. Most interesting of all, it is written in a completely invented script. 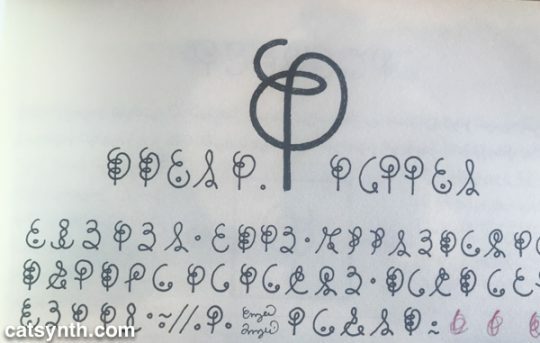 The script, consisting of squiggles and dots, sometimes detached and sometimes cursive, resemble a Western, Semitic or South Asian script, but one entirely of Serafini’s own imagination. It is easy to pick out repeated letters, such as the “E-like” character with one dot in its lower section; and curve-on-a-stem that appears to serve as a singular character in many portions of the first book. Serafini himself has declared the writing in the Codex to be asemic, without a specific structure or meaning. And while I take him at his word, one cannot help but construct meaning from both the images and the writing. 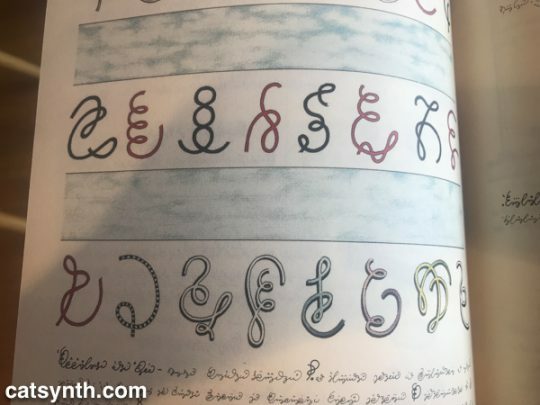 I have long been fascinated by other alphabets and writing systems and been able to find patterns (and even learn them to some degree) independent of the languages they represent. For example, I was able to learn a bit of the Tamil script when traveling in South India in my youth, though I never learned the sounds or the language. Similarly, I began to pick up Sinographic characters in my time in China but with no knowledge of how to pronounce most of them. 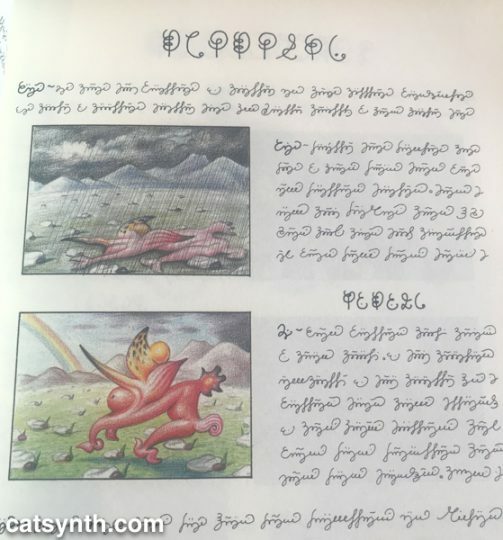 It is in this vein that I have begun to read the Codex from its start, treating it as a pure work of art with text and illustration as its medium. It’s actually a pleasurable and captivating experience to pour over the text and spot the patterns without being confined by the need for meaning. I made it through the first book (plants and anthropomorphic flora) and a bit into the second (animals). It is the fourth book (physics, chemistry) and the fifth (machines) that I most curious to “read” in depth, but I will take my time to get there. We at CatSynth are fans of 2hp, and not just The Cat. They’ve given us so many things to put in those pesky little spaces left in our modular systems, from highly useful VCAs (you can never have too many VCAs), to more exotic offerings like physical modeling. At this year’s NAMM show, the debuted four new modules covering both utilitarian and creative terrain. The one that most intrigued me was the Bell, a physical modeling voice that brings metallophone sounds. It can do vibraphone-like sounds, wine glasses, bowls, and of course, bells. With the main mallet and bar parameters (indicating that is likely based on modal synthesis), one can get a variety of combinations with CV modulation. This looks like a lot of fun – I already on the Pluck – and look forward to its release. At the other end of the spectrum is the DC module. It offers three different DC offsets along a -5v, +5v, and 10v scale. These are useful utilities when crafting specific CV signals. I could see this pairing nicely with a Make Noise Maths for more precise control, or for tuning 1v/Oct controls. Next up is the Sine, which is more than a simple sinewave generator. It does have a pure sine wave, but also a sub that allows blending of the fundamental, one octave below, and half an octave above. It also includes a wave folder function for rich harmonics. Essentially, this is another harmonic oscillator. Finally, there is the Grain, a granular processor that buffers incoming signals and allows them to be output using granular synthesis. This is a bit different from a sample-based granular module like the original Nebulae from Qu-bit which works on stored samples (the v2 of the Nebulae does allow processing of live input). The buffers can then be mangled and stretched by setting the density and periodicity of grains, along with the overall pitch. The demo we saw had this hooked up to The Cat. 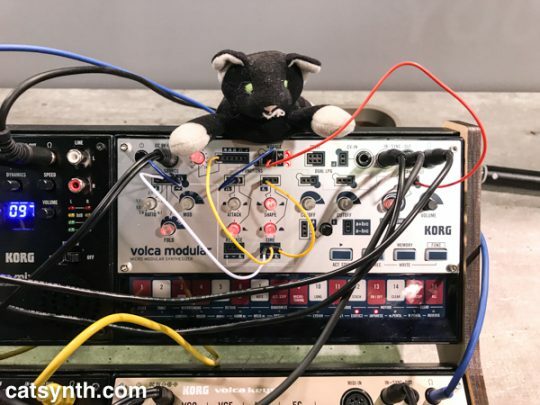 The result of the new modules plus the Cat and percussion made for a delightful demo as you can see and hear from our video. For more information about these upcoming modules from 2hp, including estimated release dates, please visit http://www.twohp.com/soon/. 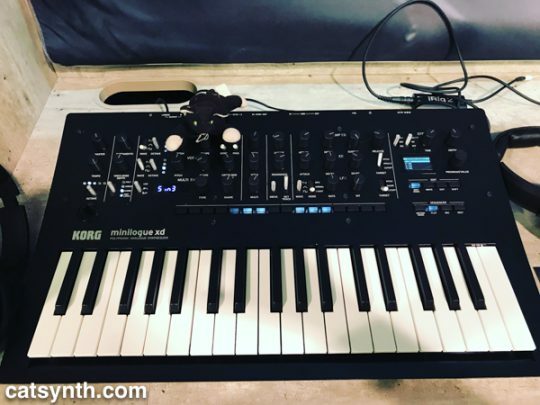 We can always count on something new from Korg these days. Sometimes it’s completely new, but this year it was new incarnations of existing lines. 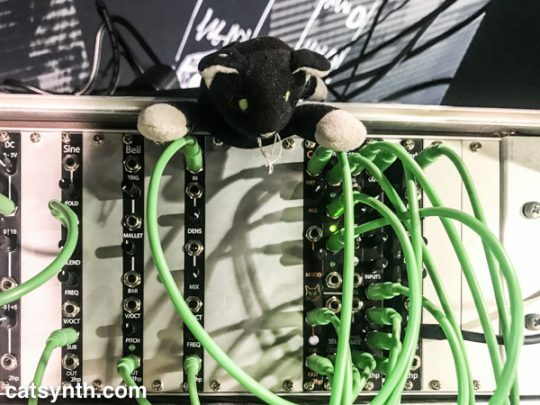 We introduced them in a recent CatSynth TV episode and describe them in more detail below. The Volca series continues to grow with its newest offering, the Volca Modular. The Volca Modular is a self-contained semi-modular synthesizer in a tiny volca-sized package. It has a VCO and modulator for complex waveforms, a function section with envelopes and an LFO, a sequencer, and various patch points for splitting and mixing. Its novel element is the LPG, a low pass gate that can be used as an amp, a filter, or something completely different a la west-coast synthesis. It puts quite a lot in a little box for just $199. It reminds a bit of some other “tiny tabletop semi-modular synthesizers” such as the Moog Werkstatt or the newer Bastl Instruments Softpop (my CDP bandmate Tom Djll uses one of these and thus I want one, too). Like those, the Volca Modular has tiny little patch points and chords, which are adorable. But unlike those, I found it difficult to patch. The wire tips were a bit flimsy and I bent at least one of them trying to create a new patch on the fly. Otherwise, though, I think this is a fine little instrument, and could end up in my Volca collection. The other new instrument was the revamped Minilogue XD. The original Minilogue made quite a splash a couple of years ago as an affordable polyphonic analog synthesizer. In addition to a nice, darker finish, the XD adds their expandable digital wavetable technology from last year’s Prologue. The digital engine has several different oscillator types and functions, and is essentially a “third sound source” for the instrument. It’s not clear to me whether this includes the same open API that the Prologue has, which would be an unfortunate omission for us at CatSynth, though probably not an issue for most users. It also has microtonal capabilities, something which is missing from many structured MIDI-analog combinations. Both of these instruments are interesting, incremental changes, with Korg seemingly defending the turf it established in the synthesizer resurgence. Neither is a top priority for us at CatSynth, but I would be surprised if they find their way to us at some point. 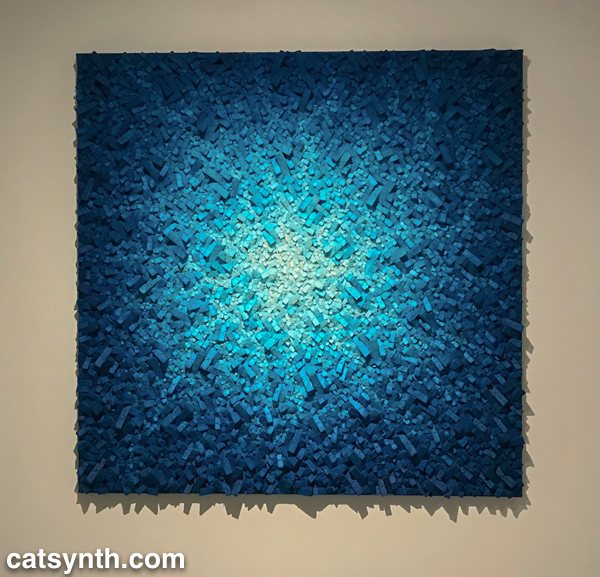 We at CatSynth have long been interested in the intersection of art, technology and conceptual process. Programmed: Rules, Codes, and Choreographies in Art, 1965–2018 surveys over 50 years of video, computational and conceptual art, cleverly weaving them together into a single narrative whole. The three disciplines are united by the concept of a “program” or set of instructions through which the work of art unfolds, whether a computer program, instructions for a performance, or strict concept on a visual object. Video and lights abound, but there is also painting, dance, and more. Installation view. Photograph by Ron Amstutz. 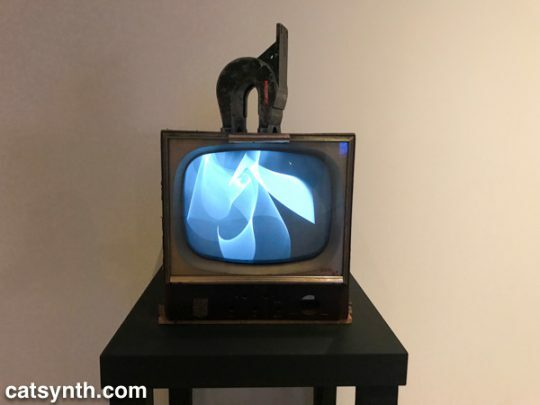 One of the artists who embodies the range of works is Nam June Paik. Immediately on entry to the gallery, we are bombarded with his massive installation Fin de Siècle II. Originally made in 1989, it has been beautifully restored for this exhibition. It contains numerous clips from broadcast video and art video taken out of context and turned into a moving collage on a grand scale. At the opposite end of the video spectrum is his 1965 piece Magnet TV. A black-and-white CRT television set is disrupted by a large magnet, creating a unique but sometimes unpredictable pattern that is in its way rather spare and graceful. Nam June Paik. Magnet TV, 1965. Modified black-and-white television with magnet. In the first piece, the process is in the composition, arrangement, and looping of the various video clips. In the latter, it is the physics of the magnet and the CRT. Motion and experiments with electronics are also at the heart of James L. Seawright’s contemporaneous piece, Searcher, which features gradual motion and changes in light. 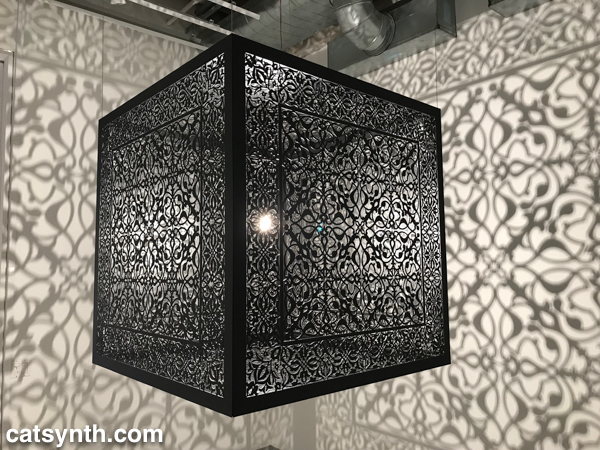 The shadows it casts are also part of the experience of the piece. 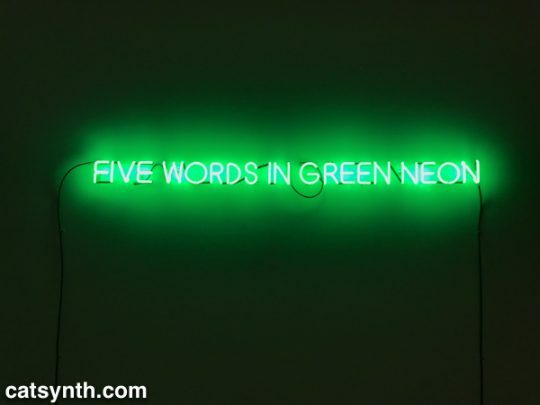 There is an interesting juxtaposition of one Joseph Kosuth’s classic neon text pieces, Five Words in Green Neon, and W. Bradford Paley’s Code Profiles, a Java program that generates images. 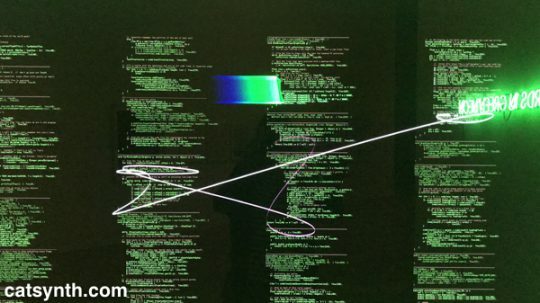 They bring together the concepts of “text as art” and “code as art” – the message is the medium. W. Bradford Paley. Code Profiles, 2002 and 2018. Java applet. Paley’s code may be one of the most literal examples of the exhibition’s theme, but code need not be computer code as we think of it today. 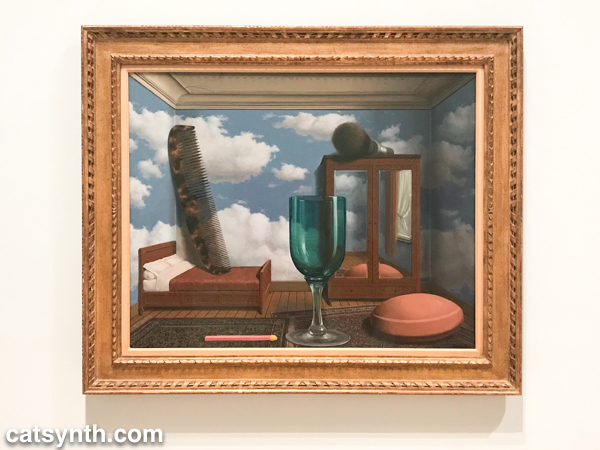 Many works from earlier periods were based on a series of instructions, where the instructions are the work and the performance or visual object are the expressions of said work. One such example is Sol Le Witt’s sculpture Five Towers. The three-dimension grids are assembled by a program with various combinations into a simple but beautiful result. I particularly enjoyed looking through it. 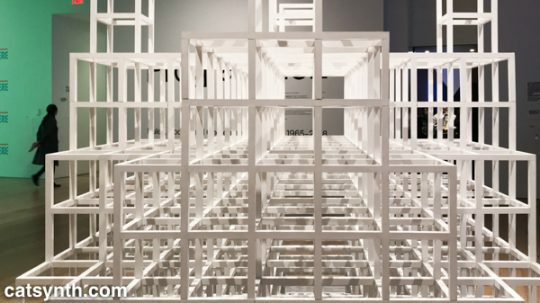 Sol LeWitt. Five Towers, 1968. Basswood with alkyd enamel paint. 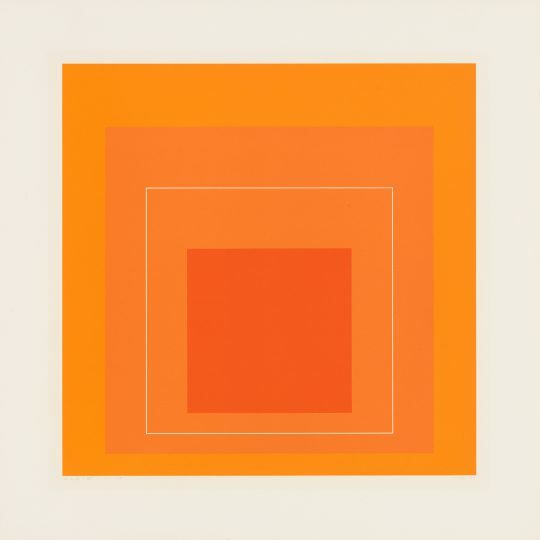 Josef Albers’ color-field rectangles can similarly be generated from a “program”. 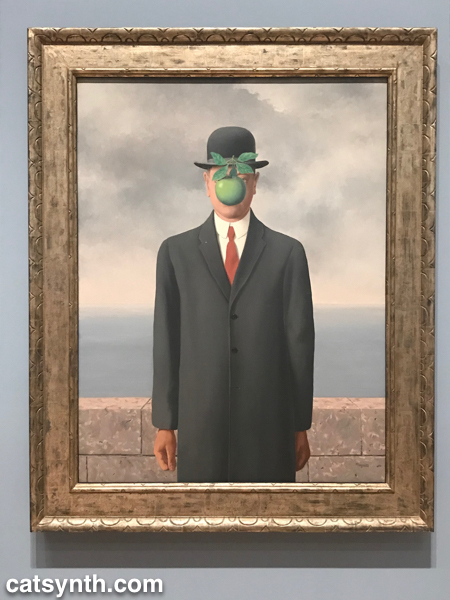 Like Le Witt’s piece, one could conceive of doing something like this with a computer, but neither artist chose to do so, instead being themselves the interpreters for the code. The performing arts have long been linked to programs, whether the traditional score or choreography, or more modern uses of algorithms or conceptual instructions. Performance was most strongly represented in the exhibition by Lucinda Childs’ Dance, done in collaboration with Sol LeWitt and Philip Glass. Childs, who is known for a precise and almost algorithmic approach to dance, choreographed a series of 5 pieces to a score by Glass. She made drawings in different colors for the different movements and projected these onto the floor. During the dance segments, the colors of her drawing were also used for the lighting. Finally, LeWitt filmed the dancers, and the film was then projected behind live performers. The documentation of this complex counterpoint was on display in the gallery, including the film, score, and drawings. Philip Glass. Score for Dance #1, 1979. Photocopy with ballpoint pen. Program, object, video and performance also come together Lynn Hershman Leeson’s Lorna. Lorna is an interactive video story on a laser disc (anyone else remember laser discs?). Users can determine how the story unfolds through one of three endings via a remote control. 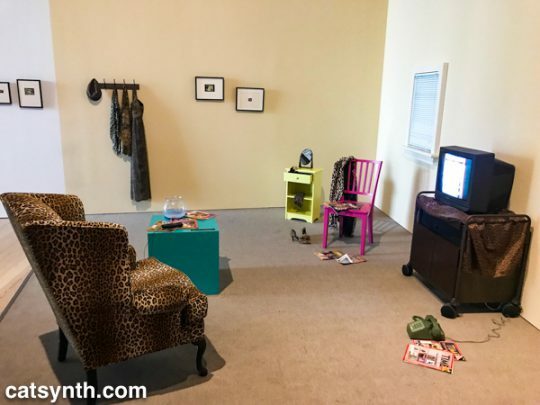 The screen and control are placed within a simulated apartment decked out entirely in leopard print, and the viewer is invited to sit in a comfy chair while the controlling the story. This self-guided performance is at once programmed, but also immersive in that the viewer becomes part of the piece, both in space and in terms of control. Video permeates the entire exhibition, popping up directly and indirectly in at least half of the pieces, or not more. But video has many different aspects. 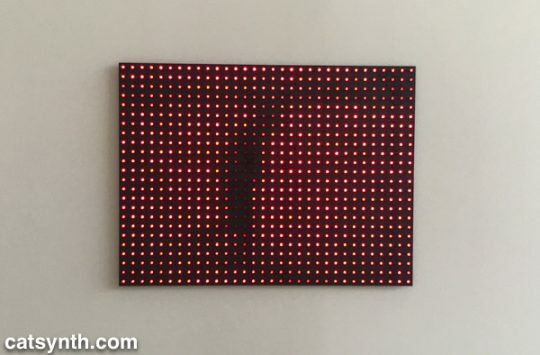 Is not a collection of discrete LEDs programmed to represent a moving image, as in Jim Campbell’s Ambiguous Icon #5 (Running, Falling), a video? It is certainly a low resolution one, but this low resolution and discrete electronics allow us to see the individual elements that simulate movement in our perception. Jim Campbell. Ambiguous Icon #5 (Running, Falling), 2000. LED lights and custom electronics. We conclude this survey with a new site-specific commission by Tamiko Thiel. 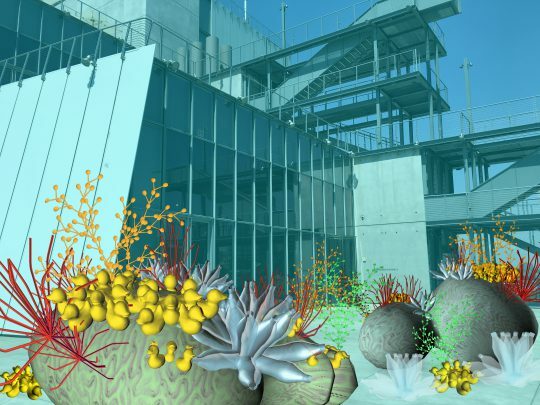 She created an augmented-reality mobile app (in collaboration with developer /p) that overlays organic forms on the angular, geometric space of the museum’s outdoor terrace. Thiel’s organic growths are beautiful and playful, but also have a darker aspect. Some resemble plastic refuse, and others coral formations. Both are emblematic of the crises facing our seas due to pollution and climate change. At the same time, the algorithmic process she uses, a formal grammar developed in 1968 by the Hungarian biologist and botanist Aristid Lindenmayer, is fascinating. 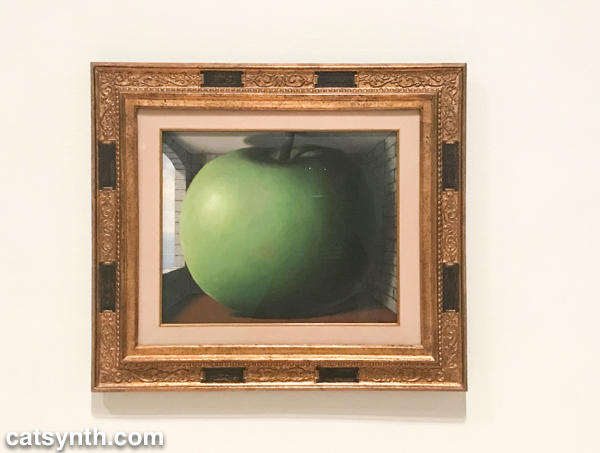 There were many more works in this exhibition that we can discuss in a single article. Each one had something compelling and different about it. For anyone interested in or curious about these forms of art, I highly recommend checking out this exhibit! 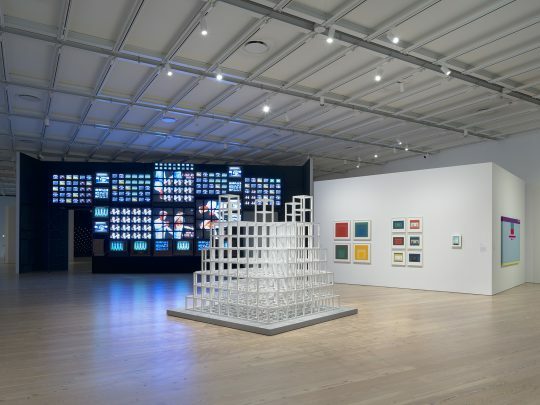 Programmed: Rules, Codes, and Choreographies in Art, 1965–2018 will be on display at the Whitney Museum of American Art through April 14, 2019. 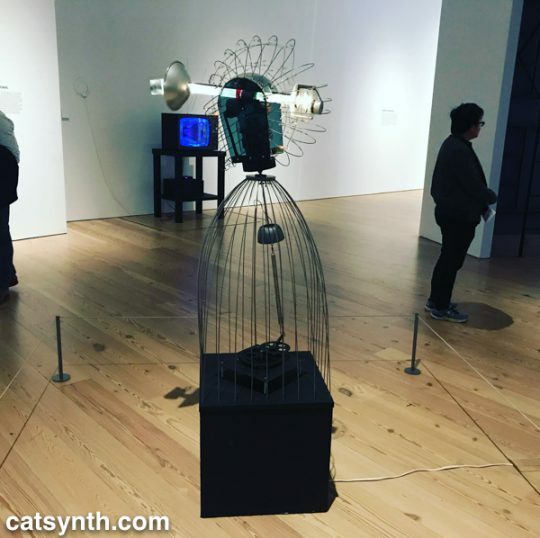 We at CatSynth spent the better portion of a recent afternoon at the Whitney Museum of American Art, taking in the entire museum top to bottom. In the first of our reports, we start at the top with a survey of the work of artist Mary Corse. 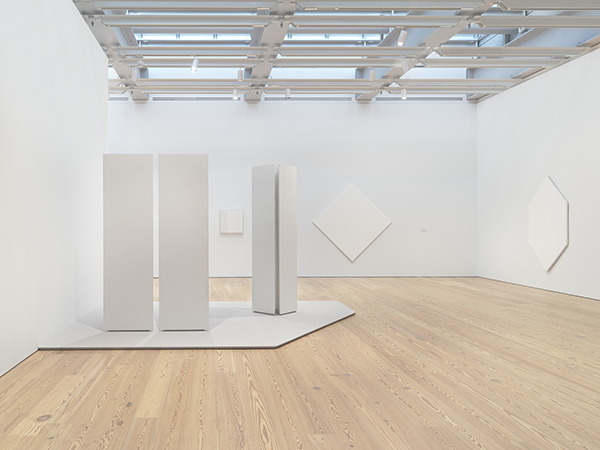 The exhibition – Corse’s first solo survey at a major institution – focuses on her work in the mid-to-late 1960s as part of the West Coast Light and Space movement. 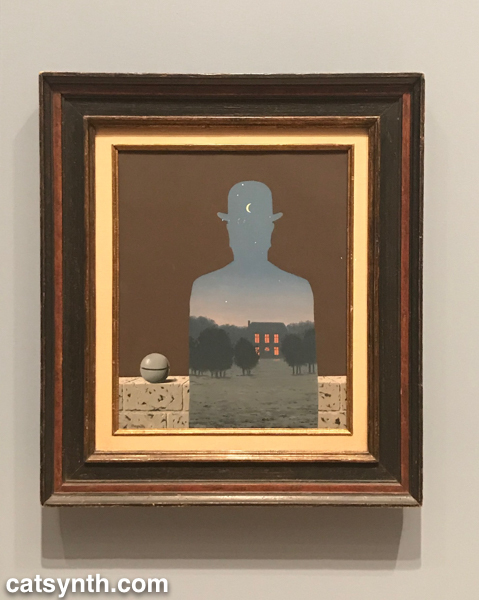 Like many of her contemporaries, Corse was very interested in the use of light as a medium in itself, but her output of light works was almost entirely focused on flat art, i.e., the kind you can hang on walls. This made her a bit of an outlier in the movement. 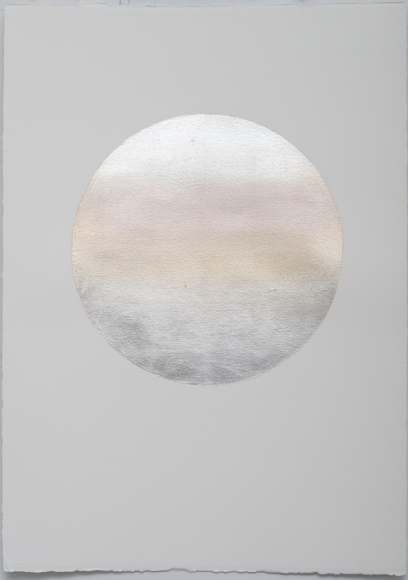 At first glance, it might be tempting to dismiss her work as “another round of white-on-white paintings from the 1960s.” But what makes it interesting is that light is at the center, rather than texture or pigment; and that she delved into emerging technologies and media to move beyond painting. 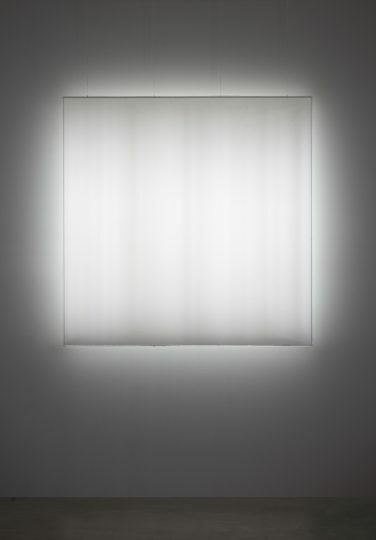 The most intriguing pieces in the exhibition were those that used plexiglass and lighting technologies. Corse studied physics and engineering in preparation for this body of work. 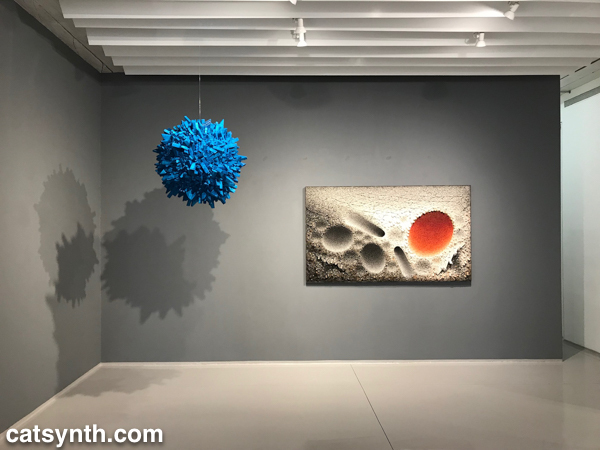 We see this in her series where custom Plexiglass elements of different depths are juxtaposed next to one another allowing different amounts of light to pass through. 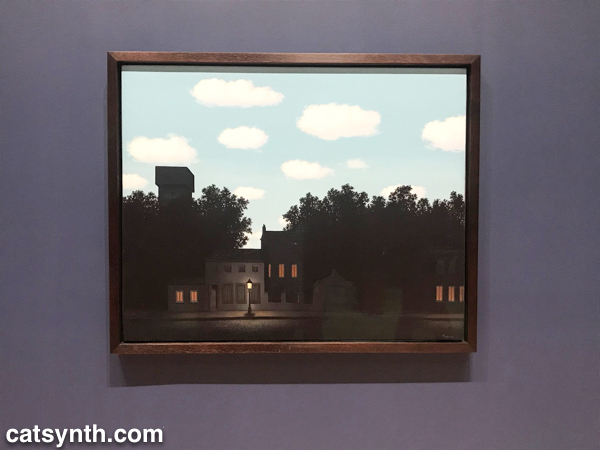 It is a subtle but fascinating set, and I found myself moving back and forth and looking from either side in my own exploration. Corse also made her own light elements with a variety of technologies, including this piece from 1968 which employed an argon light and frequency generator, once again with her own custom plexiglass. I would have loved to have seen it in action, but it was unfortunately broken at the time – Tesla coils are notoriously temperamental. But they did have a video guide on hand with a video to let us experience the work. Looking at the bands within the light, I immediately found myself thinking of the amplitudes in a time-varying sound wave, or perhaps a frequency-domain spectrum. It would have been quite interesting to “hear” it. The final set of work in the exhibition takes an abrupt turn, making the end of this period in Corse’s career. 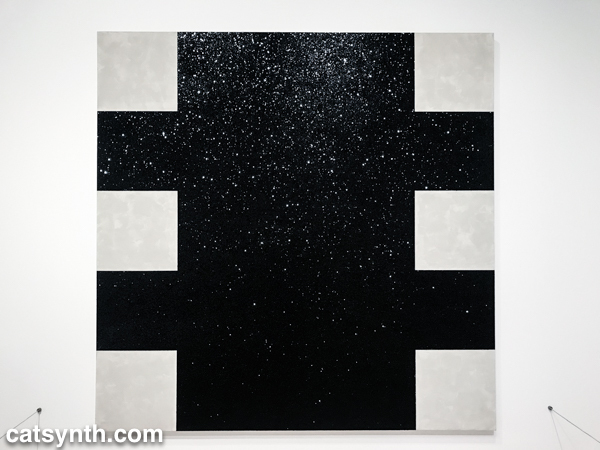 In 1970, she moved from Los Angeles to Topanga Canyon and embarked on her Black Earth Series of paintings. Beyond the obvious switch from white to black, there is a break from technology and a return to working with more traditional materials and textures. The “black” in the Black Earth Series are ceramics made in her own kilns. The glossy material is reflective, but also thick and covered in bumps and curves. 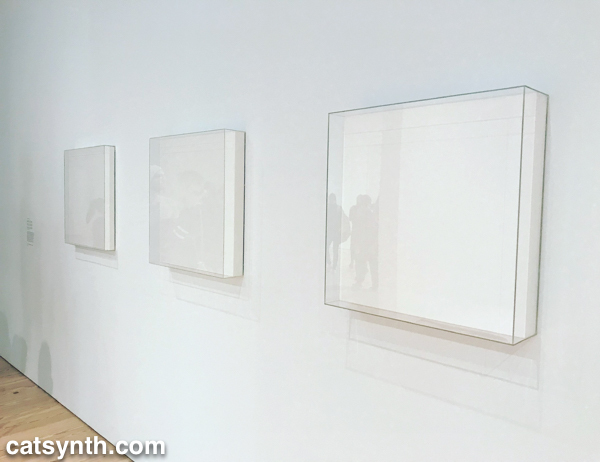 This is in stark contrast to the plexiglass surfaces of her earlier work and makes a fitting bookend for the survey. 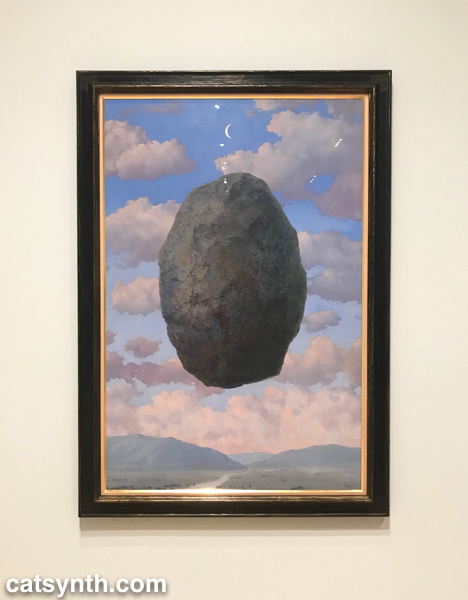 Unfortunately, the exhibition is closing this weekend, but if you happen to be in New York I recommend checking it out. It makes a fine escape from the overwhelm and sensory overload of holiday season. 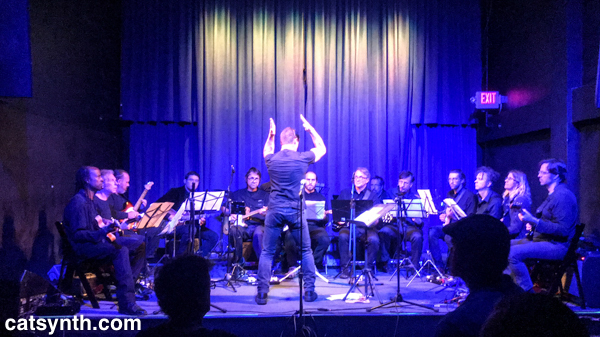 Today we look back at the show featuring Vacuum Tree Head and the Moe Staiano Ensemble at The UPTOWN in Oakland. It was also the subject of our most recent episode of CatSynth TV. This was the most ambitious Vacuum Tree Head show to date, at least during the time I have been involved in the band. There were ten musicians involved: Jason Berry conducting, Steve Adams (of ROVA fame) on baritone saxophone, Jason Bellenkes on various woodwinds, Amanda Chaudhary on keyboard, Richard Corny on guitar, Michael de la Cuesta on guitar and synth, Justin Markovits on drums, Joshua Marshall on saxophones, Amy X Neuburg on voice and blippo box, and John Shiurba on bass. 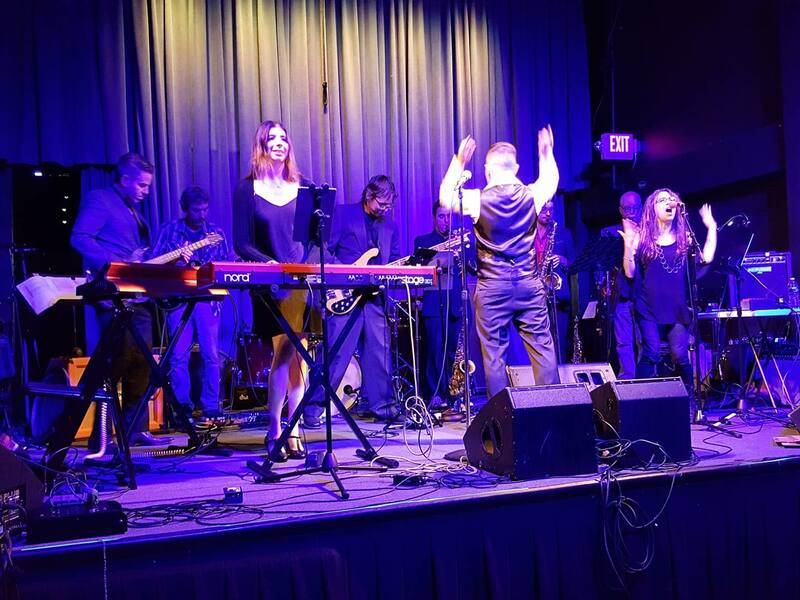 Overall, I had a wonderful time playing, as I’m pretty sure the entire band did. And we got a great response from the audience at The UPTOWN. Next, it was time for the Moe Staiano Ensemble to take the stage. This was also an ambitious set, building on Moe’s previous ideas but with an even larger ensemble of guitars: Jay Korber, William Bohrer, Melne Murphy, Damon Wood, Robin Walsh, Drew Wheeler, Bill Wolter, John Shiurba, Josh Pollock, David James, Marc Zollinger, and Karl Evangelista. That, my friends, is a lot of guitars! But they were also joined by Steve Lew on bass and Jeff Lievers on drums. 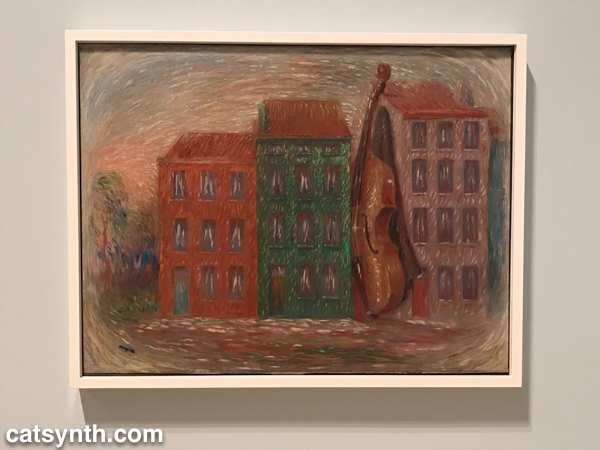 Moe’s large scale composition followed a classical form of three movements: a loud opening fanfare, a calm and moody second movement, and amore dynamic finale. It featured many of the idiomatic elements I have come to know and appreciate in his compositions from my time playing in Surplus 1980, including the repetitions coming in and out of phase. During the first movement, there was a driving eight-note patterns with phasing that created an intense but pointillated wall of sound. The second movement, which contained slower notes and lots of open space, was exceptionally beautiful, and my favorite part of the performance. You can hear some of it in our video. 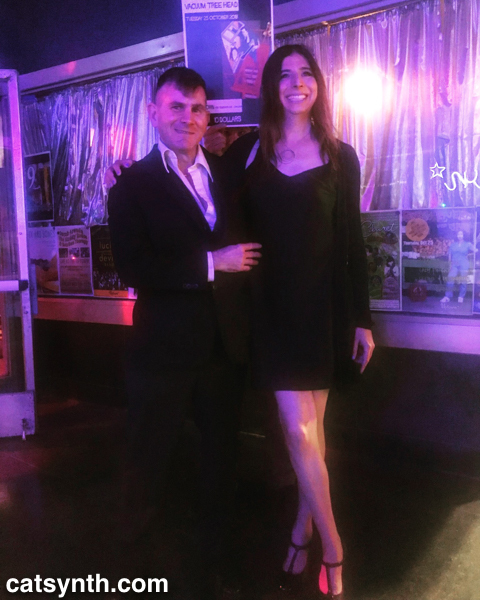 It was a wonderful night of music in Oakland, and I was happy to be a part of it both as a performance and an audience member. There was a fairly decent turnout, especially for a Tuesday. 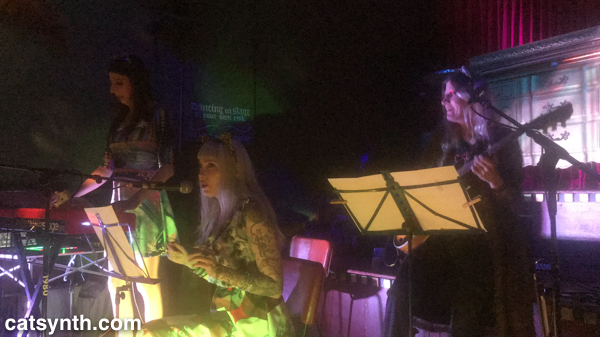 It’s not every day you can get this cast of musicians on a stage at once, as both groups did, but I look forward to the next time they do. Even as Septembers and Octobers go in San Francisco, this one has been crazy, careening between rehearsals and performances for various projects, growing in a new job, and dreading whatever new political development occurs. So our recent outing to hear SF Symphony perform the music of Igor Stravinsky was a bit of a respite. 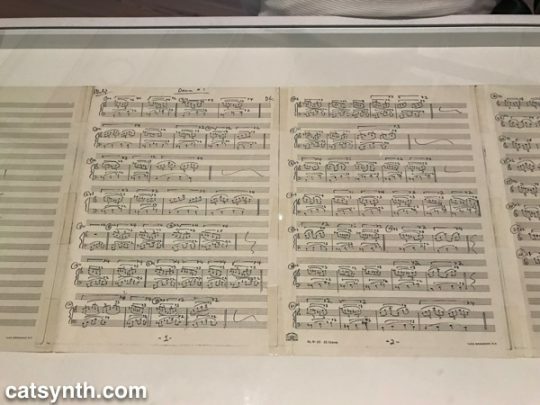 It was part of a two week-festival celebrating the music of Stravinsky that included not only the “big three” (The Firebird, Petrushka, and The Rite of Spring) but other less-frequently performed works. 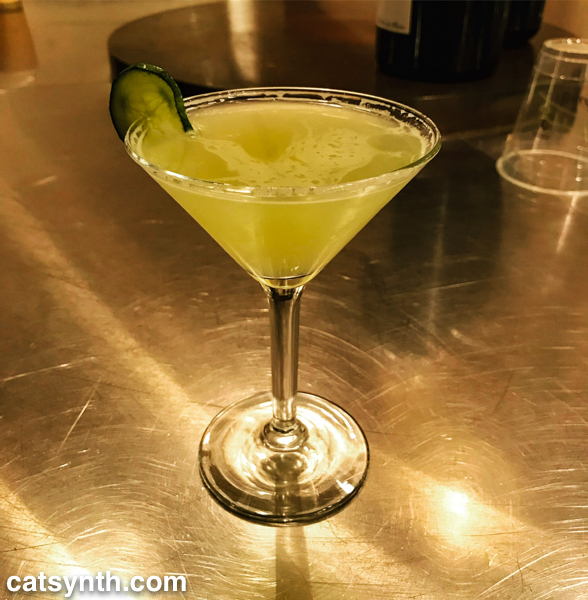 We were there for the night featuring The Firebird and enjoyed the bar’s special Firebird martini in celebration. 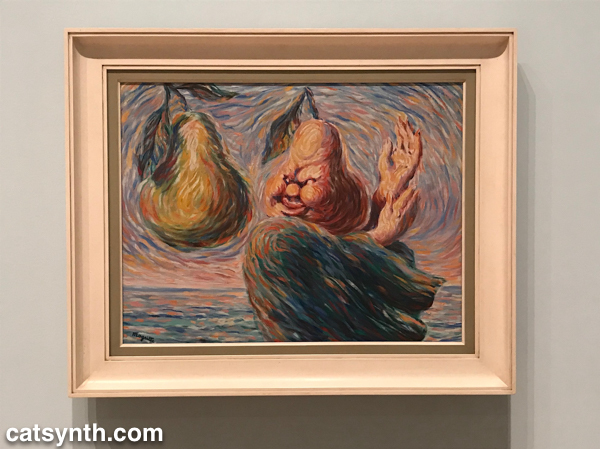 The Firebird, the first the “big three,” premiered in 1910 and while was considered avant-garde by some in Paris, it’s a very accessible work that draws more from 19th-century romanticism than from the innovations of the time. For us at CatSynth, this is about as conservative as our live music gets. But it is nonetheless an adventurous piece and very richly textured, especially in its focus on brass and wind instruments. As it was performed without staging, it was easier to concentrate entirely on the music. The early “Prince Ivan” sections had phrases and idioms that foreshadowed L’Histoire du soldat (The Soldier’s Tale); then there is that iconic ending with the slow big chords. If anything, it was the opening performance of Perséphone that was more unique an exciting. It far less often that Stravinsky’s other large-scale works, and it is complex to stage. For this performance, the symphony under Michael Tilson Thomas was joined by the great Leslie Caron as the narrator and Persephone, Nicholas Phan on tenor as Eumolpus and other characters, as well as San Francisco Symphony Chorus, San Francisco Girls Chorus, and the Pacific Boychoir. Despite the massive number of performers between the orchestra and the choruses, Perséphone has a sparse and more minimal texture than The Firebird or the other big ballets. It also has a very deliberate and punctuated quality, with each note and each syllable of the text standing alone. It does have a joyous, lyrical quality at times – it is a celebration of spring. But it also has dark, unsettling moments, which is keeping with the mythological story of Persephone, the spring goddess and daughter of Ceres being brought to Hades by Pluto. The story is one of balance between light and dark, and between the seasons. But the text in this version is somewhat more ambiguous, emphasizing Persephone’s descending to Hades by choice. It does also celebrate her worldly existence as the bride of Triptolemus and joy of rebirth, and of course the springtime. Musically we are treated to a light touch without leaning too heavily on major/minor emotional tropes, much as the story projects its ambiguity between light and dark. The winds, and piccolos, in particular, were prominent. And as stated above the space within the music leaves ample time to consider each note and word. It was a quietly but powerfully dynamic performance; and orchestra, soloists and chorus were treated to many well-deserved rounds of applause. It was our first trip back to the Symphony in a while, as their 2017 program was far more conservative and focused on traditional repertoire compared the numerous shows we had enjoyed in 2016. We do look forward to more adventurous and contemporary programming again soon.